Improve your driving skills and become a better driver in this one day Defensive Driving course. Find out how you and your car handle in emergency situations in the safety of a controlled environment. 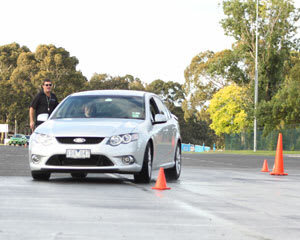 Throughout this Defensive Driver Course in Sydney, young drivers are strongly encouraged to develop better on-road defensive driving skills and more solid techniques, while more experienced drivers also benefit enormously from advanced driver training, including the correction of old habits and improving judgement and reactions. Whether your choice of vehicle is a small sedan, a large family mover, a sports car or a four wheel drive, training in defensive driving is relevant, enjoyable, and will far improve your skills and ability levels. This one-day Defensive Driving Course Level 1 course is suited to all drivers of regular passenger vehicles, including four-wheel drives and light commercial vehicles. The mix of practical and theoretical components of this advanced driver training session deliver actual on-road safety skills that underpin proactive driving. The practical driving component of our Fleet Safety and Defensive Driving Program is conducted on wet roads at suburban speeds. It includes a variety of on road exercises including emergency braking, swerving and multiple direction changes. Your vehicle with a full tank of fuel, optimal tyre pressures, water and oil levels. You must supply your own car for this experience. Suitable to all drivers 16 to 80 years (P plate drivers a speciality) and suitable to most vehicles including four wheel drives and light commercial vehicles. Presented in a relaxed, friendly, and supportive environment by qualified, experienced instructors, with a balanced mixture of theory and practical driving exercises. We guarantee that regardless of your driving experience you’ll be amazed at what you’ll learn, and what a great time you’ll have learning it with us. The Twelve Golden Rules of Defensive Driving and how they can be applied every time a vehicle is driven. Through practical driving exercises, become more ‘speed aware’, particularly in how the degree of vehicle control difficulty increases exponentially in relation to increases in vehicle speeds. This course was challenging but the staff were incredibly supportive and kind, even when I struggled. I highly recommend this course to ALL drivers, but especially those who've had an accident or are anxious when driving. Really enjoyed the defensive driving course. It's a must for anyone driving on the road and perfect for those getting their licence! the Instructors on the day were fantastic. The day was very informative and I will take this experience with me and use every day I drive. Every P plater should do this course. The best money I have ever spent. Even though the day had to be changed the staff were very hlepful in rebooking and the day went off without a hitch. I learnt a lot about my car and what to do to drive safely and defensively on bust Sydbney roads Would recommend this to every driver to learn more about how your car will handle in those situations we never want to find ourselves in! Great course, highly recommend it to anyone of any age. Learnt a lot and was heaps of fun. The staff from Driver Dynamics were fantastic. I felt safe, comfortable and learnt a lot.